Manufactured in either 1/16" or 1/8" thickness material in a wide variety of colors. Custom colors are available also. All signs are exterior rated and can have square or round corners. 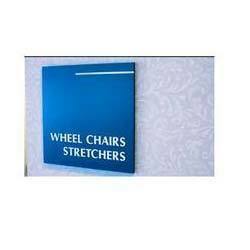 It complies with the latest ADA sign regulations which include Bead Braille and raised letters. Indoor Branding is an advanced form of storytelling and making the mask. Every aspect of how you tell your story to your guests or customers can make a difference. Our design conception, branded products, quality printing, on time delivery and installation will make your expression and taste more enrich.